Welcome to Study Campus, a place where talent is nurtured and prepared for a bright future. Having a dedicated and talented pool of highly experienced faculty members, our renowned UPSC coaching institute ranks the highest among the top 5 learning institutes in Mumbai. We have prepared many students for civil examinations, out of which most students cleared the examination with flying colors. If you are planning to be a part of the non-military department of the Indian government, then you should enroll in our upcoming UPSC batches. The Civil Services Examination (CSE) is conducted each year by the Union Public Selection Commission to recruit eligible candidates for the various top administrative posts across the non-military departments. Thousands of students appear for the preliminary examination, out of which only a few make it to the mains examination. 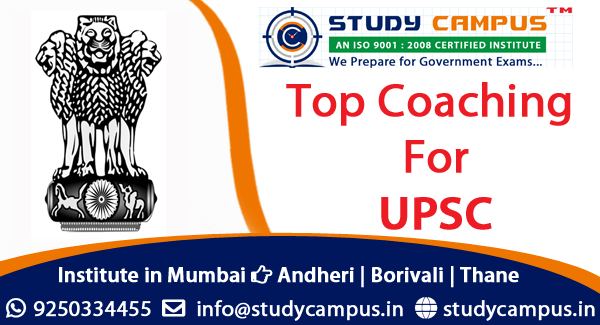 If you want to increase your chances of becoming an IAS officer or an IPS officer, then join hands with the best coaching for UPSC in Mumbai for getting a result-oriented preparation. There are many nationwide competitive examinations that aim to recruit successful candidates for different positions in different domains, then why UPSC only? If you always wanted to have a job that will give you the required power and authority to carry out any responsibility with utmost dignity, then the civil servant post is just perfect for you. As a civil servant, you will be liable to take important decision making and administrative roles for the betterment of the nation. Our UPSC coaching classes in Mumbai offers a diligently crafted tutorial that aims at delivering the contents of the syllabus in an easy to understand manner. We often receive inquiries from students residing in different areas including Andheri, Thane, Borivali, and many other locations as well for our offered courses. You can contact us for getting an in-depth detail of our UPSC course and also take guidance from our well-known faculty members. If you were looking for reliable UPSC coaching classes in Mumbai, then it has to be Study Campus for obvious reasons. You can consider the following reasons for joining us. Contact us for getting more information on our offered courses.